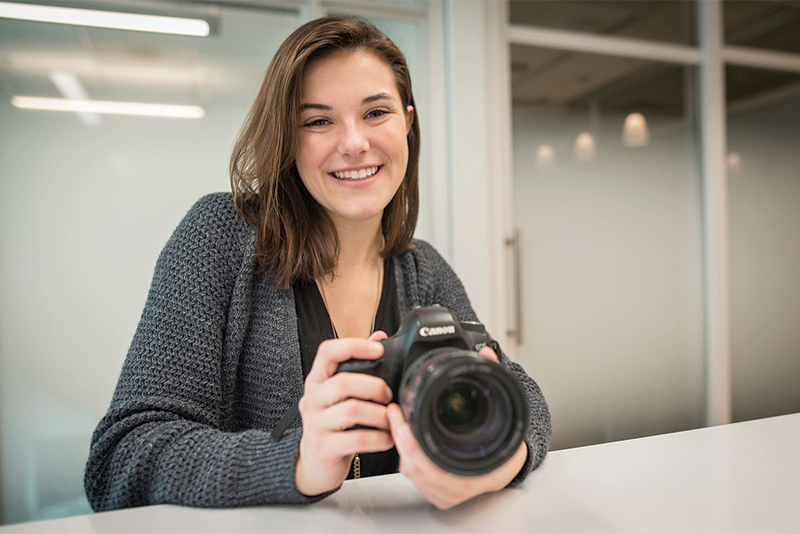 Madison Williams, a graphic communications major, poses for a photo with her camera. When Madison Williams graduated in May with a graphic communications degree, she walked the red carpet while her classmates crossed the stage at Littlejohn Coliseum. The Newbury, Massachusetts, native represented Clemson at the Cannes Film Festival in France, where her 5-minute documentary on a passionate Tiger football fan was screened alongside the work of the world’s most renowned filmmakers. “It’s a dream come true, and I have the opportunities presented to me at Clemson and many of the talented people here to thank for it,” the College of Business graduate said. Williams’ documentary, “136,” is a story about Bryson Carter of Anderson, who lost his sight as a student here but whose love for Clemson football has led him to attend 136 consecutive (now 150) games. She originally produced the documentary to compete in Campus Movie Fest at Clemson last February. Her work advanced to a national competition and eventually was selected to be screened as part of Cannes’ Short Film Corner. A year later, she was at Clemson studying graphic communications. Internships at Clemson and in Massachusetts primed her for a role on the Clemson Athletics social media team, where she cut her teeth as a visual communicator for the volleyball team. With the French Riviera experience a memory, Williams is looking forward.